In light of the Twitter API 1.1 announcement and the surrounding brouhaha, I thought I would take a moment to document how I read Twitter, since it might all have to change1. It shouldn't be surprising at all that I consume Twitter in Google Reader. I do this with the aid of two tools that I've written, Bird Feeder2 and Tweet Digest3. Bird Feeder lets you sign in with Twitter, and from that generates a "private" Atom feed out of your "with friends" timeline. It tries to be reasonably clever about inlining thumbnails and unpacking URLs, but is otherwise a very basic client. The only distinctive thing about it is that it uses a variant of my PubSubHubbub bridge prototype to make the feed update in near-realtime4. What makes it my ideal client is that it leverages all of Reader's capabilities: read state, tagging, search (and back in the day, sharing). Most importantly, it means I don't need to add yet another site/app to my daily routine. In terms of the display guidelinesrequirements, Bird Feeder runs afoul of a bunch of the cosmetic rules (e.g. names aren't displayed, just usernames), but those could easily be fixed. The rule that's more interesting is 5a: "Tweets that are grouped together into a timeline should not be rendered with non-Twitter content. e.g. comments, updates from other networks." Bird Feeder itself doesn't include non-Twitter content, it outputs a straight representation of the timeline, as served by Twitter. However, when displayed in Reader, the items representing tweets can end up intermixed with all sorts of other content. Bird Feeder lets me (barely) keep up with the 170 accounts that I follow, which generate an average of 82 tweets per day (it's my highest volume Reader subscription). However, there are other accounts that I'm interested in which are too high-volume to follow directly. 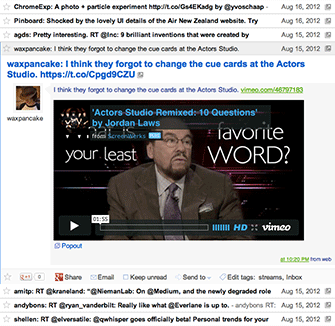 For those I use Tweet Digest, which batches up their updates into a once-a-day post. I group accounts into digests by theme using Twitter lists (so that I can add/remove accounts without having to resubscribe to the feeds). It adds up to 54 accounts posting an average of 112 tweets per day. This approach to Twitter consumption is very bespoke, and caters to my completionist tendencies. I don't expect Twitter's official clients to ever go in this direction, so I'm glad that the API is flexible enough to allow it to work, and hopefully that will continue to be the case. Though I'm hoping that I'm such an edge case that Twitter's Brand Enforcement team won't come after me. Bird Feeder is whitelisted for Ann's and my use only. This is partly because I don't want it to attract Twitter's attention, and partly because I don't need yet another hobby project ballooning into an App Engine budget hog. However, you're more than welcome to fork the code and run your own instance. It's amazing that Tweet Digest is almost 5 years old. Time flies. This was a good excuse to learn Go. Unfortunatley, though I liked what I saw, I haven't touched that code (or any other Go code) in 6 months, so nothing has stuck. Interesting! I've been trying something like this, but instead I used Yahoo! Pipes to filter a feed I took from a site who monitors my stream for links (siftlinks.com). the twitter atom feed is much more limited than your solution, but it's simple and good enough for me. for g+, i use https://plusstreamfeed.appspot.com/ . looks like you're still using a variant of this, now in newsblur? cool! me too. for posterity and other readers, mine are open to other users, and still small enough that they've survived so far: twitter-atom, facebook-atom, instagram-atom, plusstreamfeed.